About mid December, Windows Insider boss Dona Sarkar nixed release of further Insider Preview builds in 2016. Even so, build 14997 leaked via BetaArchive on 12/24. It’s apparently chock-full of changes, including an amusing shift in the color palette. When Windows 10 crashes in 14997, instead of showing a blue screen, the background is now green. 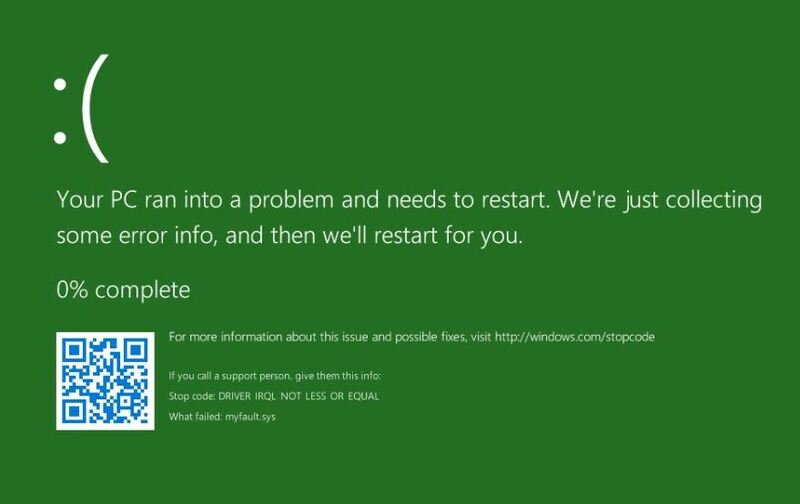 Thus, the acronym is no longer BSOD for “blue screen of death” but rather, GSOD for “green screen of death.” BSOD meet GSOD! Neowin reports speculations that the color change makes it easier to distinguish Insider Preview crashes from production Win10 versions. When BSOD Meets GSOD, What Happens Next? Apparently, the color difference is supposed to help MS support staff quickly determine whether problems come from Insider or production OS versions. Though there’s no official word on this from MS yet, most insiders believe that the change is purely cosmetic. After living with BSODs since the 1990s, it’s amusing and intriguing to see such changes come along. Who knows what other changes 14997 — or the next real Insider Preview build — will bring? We’ll have to wait until after New Year’s to find out. Rank-and-file users probably won’t notice anything different. Hopefully, it’s because they will see no “screens of death” of any kind. But if they do see any, they’ll remain true-blue for the foreseeable future. Happy New Year!